With the increase in advertisements, and social media, people are relating regenerative medicine therapies to “stem cell” treatments. Typically, when discussing regenerative medicine, the first question we are asked is “what is the stem cell count”. 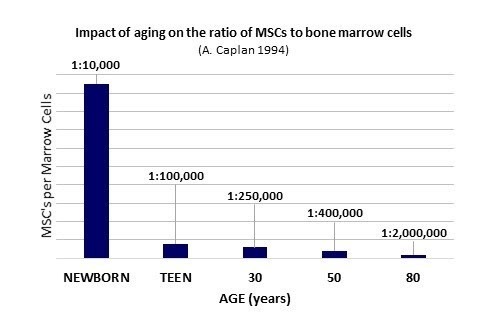 Regenerative medicine is much more than just stem cells, whose outcome is very dependent on the age of the patient they are being harvested from, (Figure 1) which is why often taking your own stem cells is not effective. One of the most valuable aspects of a science-driven approach to regenerative medicine is that our understanding evolves with the science. We once bought into the same “stem cell-based therapy” model that everyone else touts, but as scientists scrutinized the data, they came to embrace a view shared by hundreds of other leading regenerative medicine researchers – including the father of the mesenchymal stem cell, Dr. Arnold Caplan. In June 2017 Dr. Caplan publish an article: Mesenchymal Stem Cells: Time to Change the Name. In this article Dr. Caplan refers to these cells as “medicinal signaling cells”, capable of releasing paracrine effectors which thereby influence the body via immunomodulatory and trophic mechanisms. These bioactive factors recruit the patient’s stem cells, which reside throughout all the tissues of our bodies, and affect the phenotypic and physiological expression of our immune system. So, if these bioactive factors are so effective, why is so much attention paid to stem cells. The answer lies in the fact that the old textbooks remain on the shelves and those who have read them continue to preach their teachings. In addition, alternative therapeutic options have only recently become available on the marketplace. One of these options is the exosome. Exosomes are comprised of tiny extracellular vesicles derived from MSCs. They are 40-100 nanometers in size and contain lipids, messenger-RNA, micro-RNA, signaling cytokines, and proteins to help create a regenerative response to various treatment therapies. Exosomes have a variety of reported functions and some of the better-documented activities are associated with a form of immune regulation. Exosomes are anti-inflammatory, anti-fibrotic, cross the “blood-brain barrier,” have minimal risk of clumping, are easy to administer, contains nearly three times more growth factors compared to adult stem cells, and influence the growth of target cells. Exosomes are primarily used in cell signaling and are found in all bodily fluids. Cells communicate with each other using cytokines. These are proteins that are excreted by one cell and tell another cell what to do. Think of an orchestra and how the conductor ensures all instruments product beautiful music instead of noise. The conductor, in this case, is the exosome! 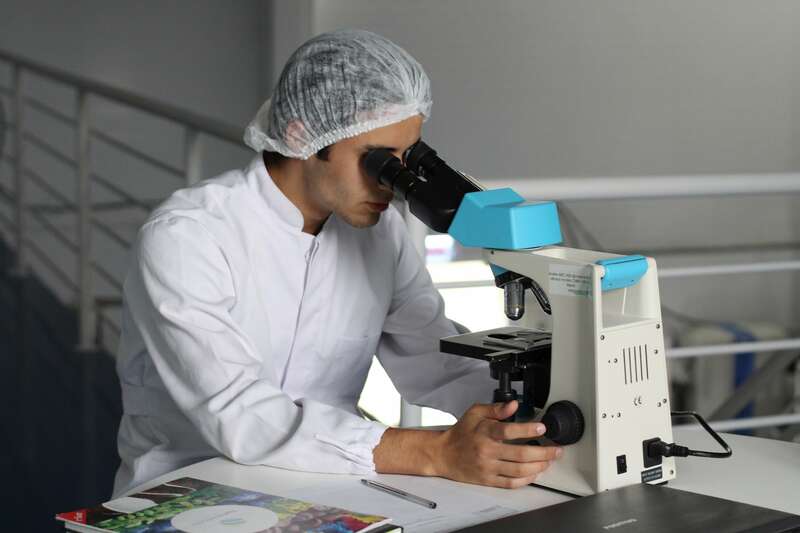 The use of exosomes also holds the promise of being more cost-effective from the point of view of storage, logistics, manufacturing, and delivery. • Mesenchymal Stem Cells (MSCs) are known to play a vital role in the regeneration of injured tissue by targeting injured or diseased cells and secreting bioactive factors, Bioactive factors secreted by MSCs stimulate resident stem cells that then construct new tissue. Exosomes have the potential to recapitulate this therapeutic function while avoiding issues associated with using whole stem cells. • Within regenerative medicine, exosome therapy is the latest treatment that is impressing doctors – many argue that exosomes may be more important than stem cells due to their unique ability to function as a “messenger” within the body, transferring information from cell to cell. Enhancing regenerative medicine therapy with exosomes is considered a superior and optimal therapy. • Due to their small size, exosomes are better able to avoid entrapment in filter organs and cross biological barriers than mesenchymal stem cells. • Due to their acellular nature, there is a low risk of adverse side effects such as neoplastic transformation or eliciting an immune response. Common scaffolds like PRP, Wharton’s Jelly or the extracellular matrix of the amniotic membrane serve the dual purpose of cell retention and cell migration as well, without significantly elevating and sometimes reducing the cost of the procedure depending on the diagnosis.